Why should I visit Aride? It is simple. There are other beautiful islands in Seychelles, but Aride is the best one. No other island is so pristine or uncrowded and yet remains accessible to visitors. Miss Aride and you miss a chance to see Seychelles as it was before discovery by the outside world. You have not seen the island with more birds of more species than the other 40 granitic islands combined. You have not seen the only home of the fragrant Wright's Gardenia. You have not spent a full day on one of the finest nature reserves in the Indian Ocean. You have not seen the spectacular view where thousands of frigatebirds soar above the the last granite cliffs before India. You have not seen Seychelles. Click Here to read about the Flora and Fauna. How do I visit Aride? Aride Island is open to visitors Monday-Friday. Visits on Saturday and Sunday are possible by prior arrangement with the Island Manager (call 271 97 78). Please note that Aride often closes to visitors from May to September due to strong surf making it difficult to land by boat. To avoid disappointment, try to arrange a visit early in your holiday leaving an alternative date to fall back on should the island have to close. If not travelling with an organised group please check if the island is open with the Island Manager prior to departure to avoid disappointment. 3. By joining a cruise. There are occasional one-off visits and more regular visits by boats of Silhouette Cruises, click here to visit the Silhouette Cruises website. 4. 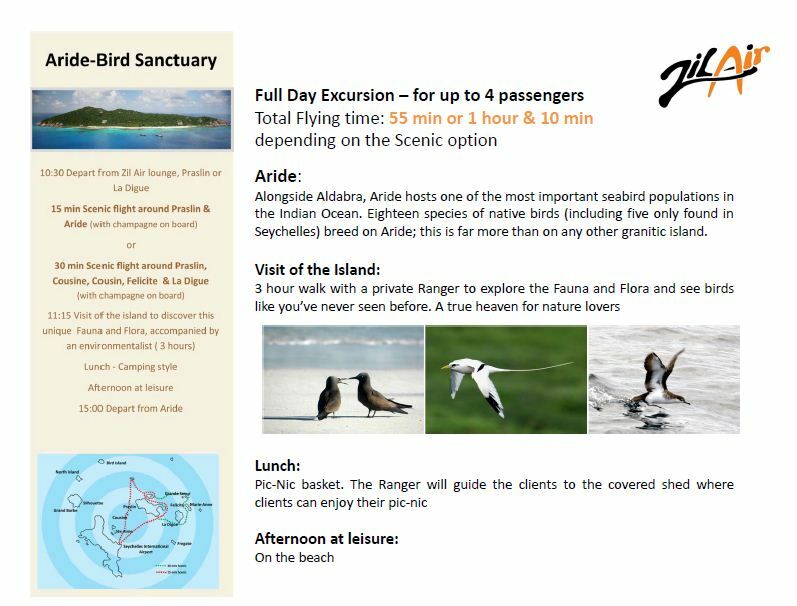 By helicopter through Zil Air (see their advert below or visit the Zil Air website).